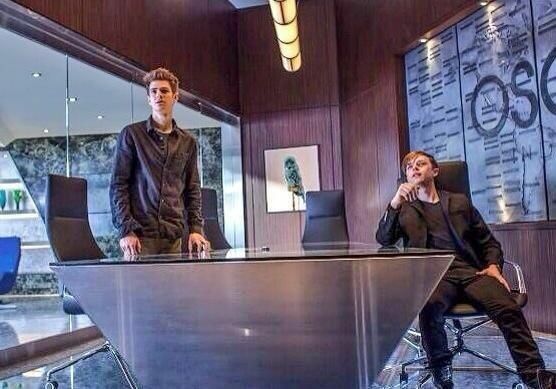 A new image from director Marc Webb’s upcoming sequel The Amazing Spider-Man 2 has landed online, giving us another look at Andrew Garfield’s Peter Parker and Dane DeHaan’s Harry Osborn. DeHaan’s character is seen lounging rather comfortably in a desk chair at Oscorp, appearing as though he’s dropping some knowledge on his old friend Parker. In this iteration of the story, Parker and Osborn were childhood friends but haven’t seen each other in years. The young Osborn is forced to return home after graduating from college in order to deal with some family issues, which likely have something to do with his father, Norman Osborn, played by Chris Cooper in Webb’s film. Hit the jump to check out the new image, and click here if you missed our recap of the pic’s swell Comic-Con panel. The film also stars Emma Stone, Jamie Foxx, Paul Giamatti, Felicity Jones, and Sally Field. The Amazing Spider-Man 2 opens in 3D on May 2, 2014. In The Amazing Spider-Man 2, for Peter Parker (Andrew Garfield), life is busy – between taking out the bad guys as Spider-Man and spending time with the person he loves, Gwen (Emma Stone), high school graduation can’t come quickly enough. Peter hasn’t forgotten about the promise he made to Gwen’s father to protect her by staying away – but that’s a promise he just can’t keep. Things will change for Peter when a new villain, Electro (Jamie Foxx), emerges, an old friend, Harry Osborn (Dane DeHaan), returns, and Peter uncovers new clues about his past.